1. Pour the cold water into a large non-stick frying pan and add the fish, skin side up. Bring to the simmer and immediately turn off the heat. Leave the fish to poach for 5 minutes. Remove the fish from the water with a slotted spatula and leave to drain. 2. Pour the poaching water into a large saucepan, stir in the turmeric and bring to the boil. Rinse the uncooked rice in a sieve under cold running water and add to a saucepan with the poaching water. Return to the boil and cook for 10-12 minutes, stirring occasionally until tender. 3. Meanwhile, fill half a medium pan with water and bring to the boil. Gently add the eggs and return to the boil. Cook for 9 minutes then drain in a sieve under cold water until cool enough to handle. 4. Strip the skin off the haddock and discard. Flake the flesh into large chunks. Cover and keep to one side. 5. 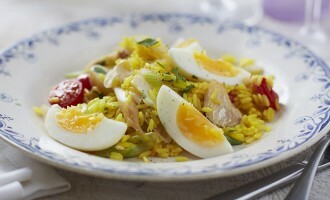 Save a few of the coriander sprigs for garnishing the kedgeree then trim and roughly chop the rest. 6. Heat the oil in a large non-stick frying pan, add the spring onions and cherry tomatoes and fry over a medium heat for 2 minutes, stirring. Sprinkle over the curry powder and cook for 1 minute more, stirring constantly. Remove from the heat. 7. Drain the rice well and tip into the frying pan with the spiced spring onions and tomatoes. Add the chopped coriander and plenty of freshly ground black pepper and mix well. Stir the fish gently through the rice and warm through over a low heat for 1-2 minutes until the fish is hot. 8. Peel the eggs and cut into quarters. 9. Tip the rice mixture into a warmed serving dish, dot with the quartered eggs, scatter a few coriander leaves over the top and serve immediately.